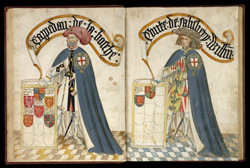 The 'Cappedan de la Bouche' (left) identified by the inscription on the scroll overhead is Sir John de Grailly. The drawings are no longer in their original order and probably have been cut down to a smaller size. The figure facing represents William, Earl of Salisbury.